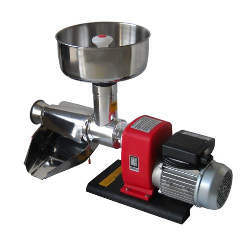 These tomato squeezers are the ideal tool for making tomato sauce at home. 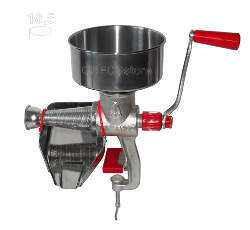 Available some kind of manual (hand crank) tomato squeezers and many motorized items. 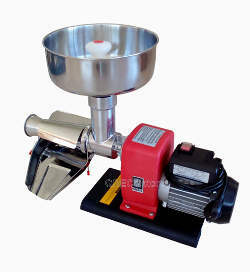 HOW IT WORKS: During the operation, the screw/worm squeezes the tomato and pushes it onto the filter wall: through that action the squeezer separates seeds and peels from pulp and juice by means a stainless steel sieve/filter. 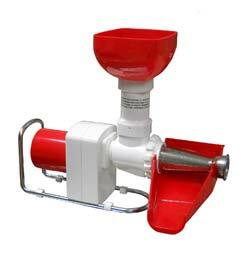 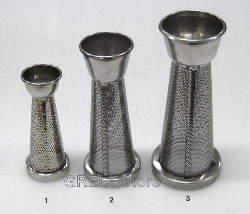 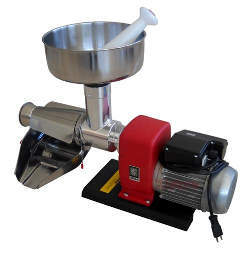 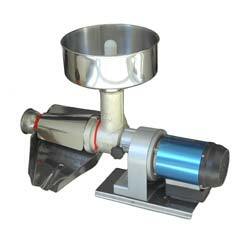 It can be used for squeezing vegetables, fruits, for preparing fruit juices, jams, mashed potatoes. 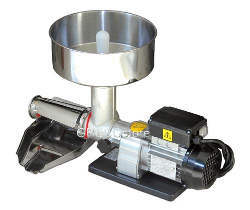 The squeezer body is made in cast-iron or die-cast aluminium (except Solemio); the hopper, filter, chute/collector, motor cover/ filter cover are made in stainless steel (except Solemio)..
HAND CRANK TOMATO SQUEEZER "TRE SPADE"
squeezer body in die-cast aluminium and worm in acetal resin; filter, chute and hopper in stainless steel AISI 304; single-phase motor 0.37 HP - power 400 W.
squeezer body and worm in hot tinned cast iron; single-phase motor HP 0.40; hopper, chute and filter in stainless steel AISI 304.
single-phase motor 0.60 HP - 600 W.
squeezer body and worm in hot tinned cast iron; single-phase motor HP 0.60; hopper, chute and filter in stainless steel AISI 304.